On our last day in Jerusalem we were able to tour the Israeli Supreme Court. The Israeli Supreme Court building is conveniently situated between the Israeli Parliament building (the Knesset) and the office of the Prime Minister. Our tour guide explained that this was purposeful, and was meant to symbolize the role of the judiciary as mediator of conflict. As we entered the building, I was taken aback by the amount of natural light entering through the windows. Though it was a very rainy day, there was no need for lamps or artificial lighting in the foyer. Another physical attribute of the Court foyer that caught my eye was the aesthetic created by a wall made entirely out of Jerusalem stone (a sandy-white limestone out of which most buildings in Jerusalem are constructed) standing opposite of a clean unadorned wall of white plaster. Our tour guide explained that this juxtaposition was meant to symbolize how the laws of men on Earth should complement the ultimate pursuit of eternal justice. One of the first things to surprise me was that the Israeli Supreme Court actually operates similarly to the United States Court of Appeals. I had originally expected the highest court in Israel to resemble the Supreme Court of the United States. Not so. Like the U.S. Court of Appeals, the Israeli Justices (13 total) typically preside over cases in panels of three. Additionally, parties to a suit are entitled to an appeal at the Israeli Supreme Court as a matter of right. Moreover, any person may directly petition the Israeli Supreme Court (and bypass the district courts) if an action by an Israeli governmental entity contradicts/contravenes the basic laws of the Knesset. This last point reminded me of the power of the D.C. 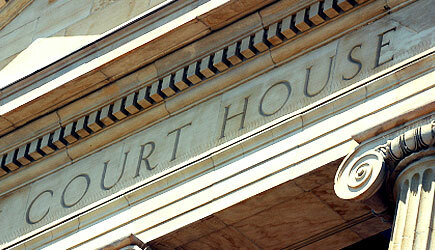 Circuit to hear cases involving federal agency action. We ended our tour with the opportunity to meet and ask questions of former Israeli Supreme Court Justice, Dalia Dorner. Our meeting with Justice Dorner admittedly deserves its own blog post, but I’ll try to summarize some of the nuggets of information that stuck with me. First, I learned that Israeli Supreme Court Justices are mandated to retire, by law, at age 70. However, retired Justices may continue work out of their offices at the Israeli Supreme Court if they return to private practice. I don’t know if this custom has been scrutinized, but I certainly wouldn’t want to oppose an attorney whose office happens to be next-door to a Justice set to preside over our case. That smells like conflict and partiality. Second, one of the most interesting wrinkles in Israeli jurisprudence stems from the fact that Israel does not have a formal written Constitution. One consequence that results from the lack of a formal written Constitution is that there are no textual limitations on the power of the judiciary to hear a case. In the U.S., for example, the Constitution limits the Court to hear only “cases and controversies” and this textual limitation led to the development of the doctrine of justiciability. No such equivalent exists in Israeli jurisprudence, and that gave me the sense that the Israeli high court may have more unfettered discretion or power relative to the United States Supreme Court. On our last day, we met again with Justice Aharon Barak, former president of the Supreme Court. Visiting with him to close the trip is truly wonderful.